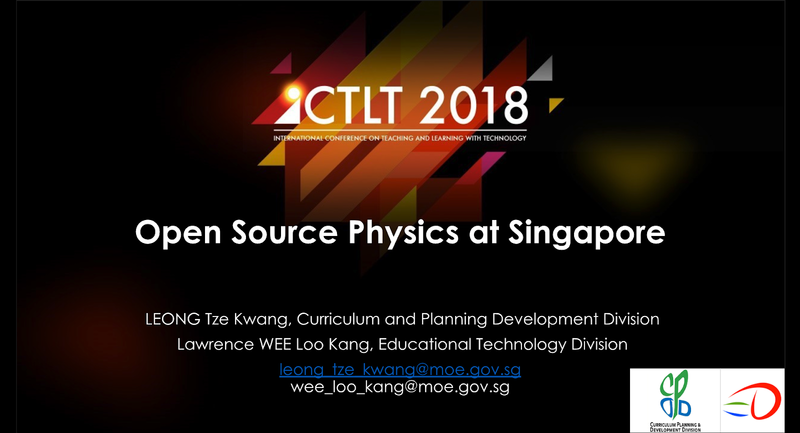 Congratulations on your iCTLT 2018 proposal ‘Open Source Physics at Singapore’ being accepted for the Paper Presentation segment. Out of the 319 proposals that were submitted and reviewed, 92 proposals were accepted. The acceptance rate of proposals for iCTLT 2018 is 28.8%. The theme of the conference “Shape the Future, Be a Spark” invites educators to share insights, practices, experiences, and research studies on harnessing technology for 21st century learning, so as to envision and share emerging trends, pedagogical use of cutting-edge technology and innovative use of established technology for learning and teaching. Below are the reviewers’ comments regarding your proposal, for your consideration please. This proposal described the resources that have been created meet the pedagogy requirement of making learning authentic to students. These resources are sustainable as they belong to an online open source platform. To further highlight the value of these resources, do consider including some findings from literature on the usefulness of such visualisation tools in the learning of Physics. Do also consider briefly sharing how the impact of OSP has extended beyond Singapore by sharing statistics on simulation apps download and reviews from users beyond Singapore’s shores. All presenters are required to register for the main conference. For MOE educators, the main conference registration fee (SGD 909.50 per pax) will be borne by MOE. For non-MOE educators (i.e. school direct hires), the main conference registration fee will be charged to the school. The optional pre-conference fee (SGD 214 per pax) is payable by the school for both MOE and non-MOE educators. Due to logistical constraints, a maximum of two presenters is allowed for each accepted proposal. To confirm your acceptance of the Paper Presentation, please complete all the fields in the attached spreadsheet with the two presenters’ details and reply by 31 January 2018. We look forward to seeing you at iCTLT 2018! The iCTLT 2018 Organising Committee would like to share some updates on the preparation for iCTLT 2018. The conference theme is “Shape the Future, Be a Spark.” The focus for iCTLT 2018 is on the importance and catalytic nature of educators’ role in helping to realise our vision for ICT in Education, which is to nurture “Future-ready and Responsible Digital Learners.” Every educator has a significant role to play in translating the future according to his or her ability and contribution. 30 May to 1 June 2018. The three-day conference comprises a half-day pre-conference (30 May) and two-day main conference (31 May to 1 June). We have 4 keynote and 6 spotlight speakers who have tentatively agreed to join us at iCTLT 2018. The keynote speakers are: Prof Rose Luckin (UCL, UK), Prof Manu Kapur (ETH Zurich, Switzerland), Prof Lim Sun Sun(SUTD), and Prof Tsui Kai Chong (SUSS). The spotlight speakers are: Dr Shuchi Grover (ACT, USA), Keith Krueger (Consortium for School Networking, USA), Julie Inman Grant (Office of the Children’s eSafety Commissioner, Australia), Bart Verswijvel (European Schoolnet, Belgium), A/P Zachary M. Walker (NIE), and Peter Ho (HOPE Technik Pte Ltd). The call for proposals opened on 25 Aug 2017, and is due to close on 13 Oct 2017. Do encourage your colleagues and schools that you work with to submit a proposal to present at iCTLT 2018. Please refer to the attached email for more details. Thank you for your support, and we look forward to working with you to make iCTLT 2018 a conference that we can be proud of. The Ministry of Education (MOE) Singapore will be hosting the iCTLT 2018 Conference from 30 May 2018 to 01 June 2018. This biennial iCTLT is a strategic platform for educators to provide thought leadership and champion the effective use of technology for 21st century learning. The theme for iCTLT 2018 is ‘Shape the Future, Be a Spark.’. We invite you to submit your proposal(s) for presentation at the Conference. Proposal(s) must be submitted through www.OpenConf.org/ictlt2018 from 25 August 2017 to 13 October 2017. Please refer to the attached Information Sheet for more details. Open Source Physics at Singapore (OSP@SG) is a project by Singapore Ministry of Education which helps teachers bring real-world physics concepts into the classroom, to support learning with static textbook abstractions and word problems, difficult for students to comprehend. The first level pedagogical approach is to complements real-life experiments by providing interactive resources that help visualisation. The second pedagogical approach is 'mathematical modelling', where students’ ideas can be 'tested' or equation driven for comparing-fitting with real life or simulated data. The technology is HTML5(simulations) and Java(video analysis) used is open sourced where most interactive resources are accessible anytime, anywhere on students' computers and mobile devices. System wide impact on teaching and learning can be felt, judging by the vast numbers of Physics teachers and students in Secondary and Junior College and Universities using OSP@SG simulations and Tracker video analysis tool. The author and the ICT in Science learning community has being adopting the OSP@SG http://iwant2study.org/ospsg/ website with 300+ open source and open educational digital resources that runs on their own mobile devices and computers. There are even apps and e-books on Android Playstore and Apple App Store for offline use. Supporting evidences has been observed since 2012, where MOE collaborating with schools¹ on OSP@SG, with positive feedback received on the project both in Singapore and around the world. Some benefits include enhanced students’ learning through the student-centric pedagogy where students learn to experiment like real life scientists using modelling and simulation. Students could better visualise, explore and discover abstract physics concepts through manipulation and modelling techniques. Future plan is to create apps and e-books on Android Playstore and Apple App Store for offline use, so as to provide accessible, adaptable and affordable open educational interactive resources to prepare our students to be Future-ready.